The October TGO is the annual TGO Challenge issue, with reports from this year’s event and entry forms for next year’s. My contribution is an account of this year’s stormy crossing and a look at the gear I used. ** Also on gear in this issue are my test report on 17 pairs of lightweight boots and my initial thoughts on the new MSR Whisperlite Universal stove, an update of an old favourite. My backpacking column is on the theme of autumn, a wonderful season for backpacking with beautiful colours and no midges. There’s also a review of the latest edition of my Backpacker’s Handbook by John Manning (along with Andrew Skurka’s The Ultimate Hiker’s Gear Guide). Appropriately for the Challenge issue the theme of this TGO is backpacking. Cameron McNeish discusses the appeal of lightweight camping and long distance walking and suggests ten UK backpacking routes plus two overseas ones. Sweden’s marvellous Kungsleden isn’t one of the latter but it appears anyway in Carey Davies description of the mass backpacking event (2,000 participants!) that is the 110km Fjallraven Classic. The Hill Skills section sticks to the backpacking theme with advice on choosing a wild camp site, selecting the right tent, the uses of a trekking pole, repairing gear, multipurpose kit, tips for minimising the load and planning stove fuel. Away from backpacking Ed Byrne tries mountain biking; Andrew Galloway practises his navigation on Y Migneint and the Arenig mountains in Snowdonia; Jim Perrin celebrates a collection of A.Harry Griffin’s excellent Country Diary essays for The Guardian, A Lifetime of Mountain; and outdoor blogger (and TGO Challenger) Andy Howell calls on the government to prioritise outdoor activities for all rather than competitive and elite sport. In the gear section Cameron McNeish tries five pairs of hillwalking trousers and likes them all while Daniel Neilson tests Fjallraven’s Alv Lite jacket and Mammut’s Ajungilak Sphere Spring sleeping bag. 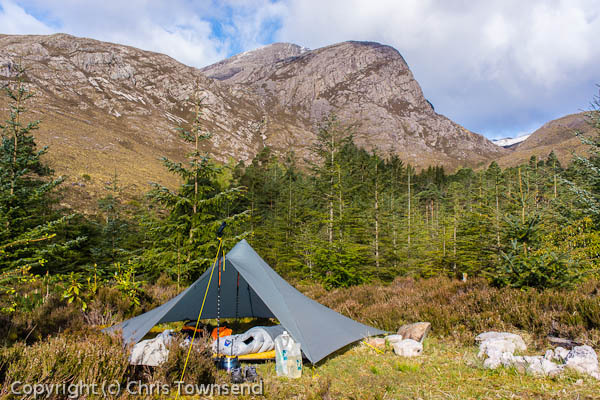 ** My full itemised gear list can be found on the TGO website here.